Waking up feeling refreshed from a great nights sleep, we were ready to take on the sights of Berlin. We had booked one of the hop-on hop-off style buses online (as it was much cheaper to do so) for £17 we were able to see all of the Berlin visitor attractions. Starting off at the TV tower, we hopped on the bus and grabbed our free headphones to listen to the audio guides as we went along. 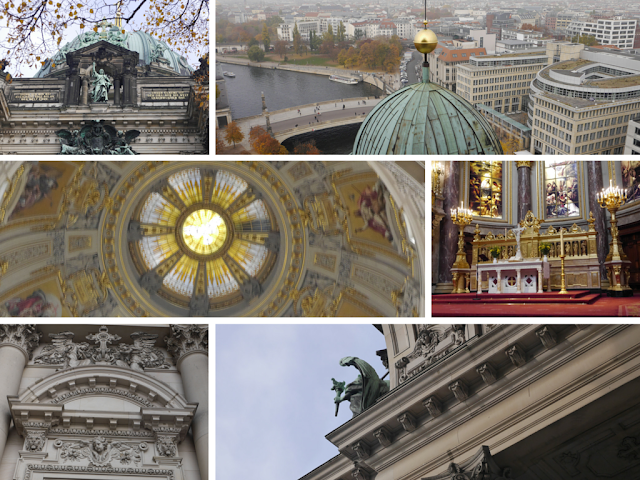 Our first stop off was the beautiful Protestant Cathedral - the Berlin Dom. For €7 each, you are able to explore this breath taking monument from going down into the crypts to climbing the 300 something steps to the top of the dome - this was probably one of my favourite highlights. 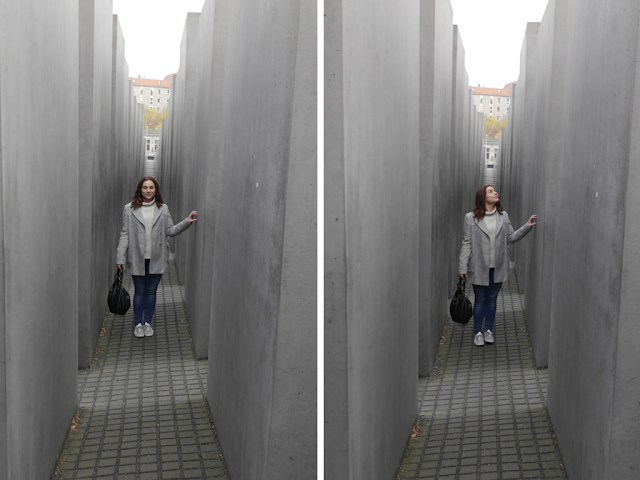 Once we'd spent an hour exploring the Dome, we hopped back on the bus and made our way to the Holocaust Memorial - a place that I really wanted to see. Over 2,000 stones sit here and represent the unified order and overwhelming sensations that would have been felt by the poor people tortured and killed by the Nazis. Another interesting fact that I learnt was that there were over 170,000 Jewish people living in Berlin before the war and only 6,000 were left once WW2 had come to an end - most had been killed, but others fled the city to other countries. Walking around the ash like tombs, there was a strange sense of sorrow and peace as we left the memorial to move onto our next stop. Grabbing a traditional bratwurst along the way, we made our way from West to East Berlin towards the Berlin Victory Statue. As we got off at this stop we discovered that this had 3x the amount of steps to climb as the dome and do we decided to simply have a stroll around the statue and it's beautiful autumnal park. Making our way back onto the warm bus, we began to make our way further into East Germany and you could quickly see the difference in locations. East Berlin is much more cosmopolitan and commercialised, whereas West Berlin holds a lot of historic heritage. Driving through Check Point Charlie, we realised that we were actually on the last bus of the day (4:39pm) and so we decided to head back to our hotel to get ready for the evening. Once the fog had cleared, we decided to take the 40 second lift up to the 200m higher TV tower. The views from up here were incredible from the viewing deck. It costs €13 to go up, but it's something that I would highly recommend. We also decided to get drinks here and had they nicest raspberry beer (which was actually green?) bizarre I know. All in all, it was the perfect end to a fantastic of the day.